Detailed information and multiple audiences meant finding simple and clear ways to communicate on the OBD Academy website. A grid structure, simple graphics and strong calls to action throughout help navigate the rich information and take you through the details of the academy in a logical way. Building in WordPress using canvas theme gave total control over all aspects of the site including downloads, email sign ups and integration with the existing site for the parent company. The simple back end means the client can edit and update the site as needed without getting bogged down in the technical details. 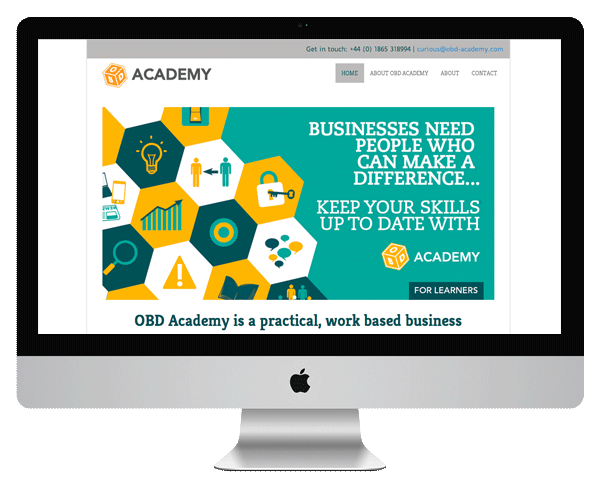 OBD Academy is a practical work-based business education programme. Designed and supported by experienced business leaders, the academy is delivered through a blend of on-line learning, off-line workbooks and real-time coaching. It gives talented people the knowledge and skills to be Entrepreneurial Leaders. Leaders who think and operate like business owners.